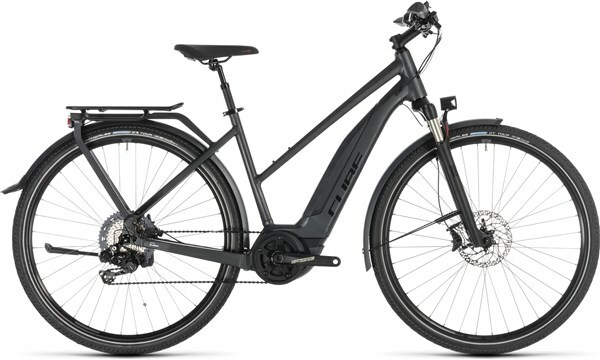 All three versions of the Touring Hybrid SL– the Easy Entry, the Trapeze and the Men's – feature optimized battery positioning, bringing the weight as low and as close to the center of the bike as possible for improved stability, better stiffness and livelier handling. What's more, the Men's and Trapeze versions feature a custom-designed cover over the battery for a neat, integrated look. Revised Efficient Comfort Geometry gives the Touring Hybrid SL sharp responses while maintaining its reputation for implacable stability, whatever the road conditions. This stability is given a helping hand by the integrated rack which provides the lightest, strongest and most rigid possible support for carrying whatever load you need to transport from A to B... whether that's a briefcase or camping equipment. We even used our Smooth Welding technology to clean up the frame's appearance, giving the impression that one tube almost flows into the next. That, and the internal cable routing, are just the kind of attention to detail that you'd expect from CUBE. Enjoy the ride.